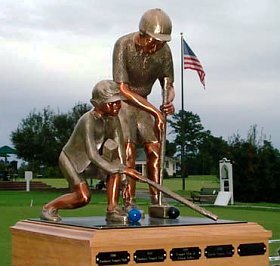 The North Carolina Club Teams Championship returns with a new format, dual events in Golf Croquet (GC) and American Six-Wicket Croquet (6W); players may enter either or both events. The tournament will be held on several courts in the Linville area. Play will begin the morning of Thursday, July 27, to conclude by mid-afternoon on Sunday, July 30. Play is doubles only, in three or more flights. There is no residency requirement. Each entry must be a doubles pair, with both players current members of the same NC croquet club and of the USCA. Space is limited to 30 entries (i.e., 60 players) in each event. Each club is initially allocated a maximum of 6 entries per event. Clubs are advised to coordinate with their players to arrange this allocation. The expected format is GC in the morning, 6W in the afternoon, or vice versa; players can expect 2 games per day during block play in each event. Hence, a player entered in both events must be ready to play up to 4 games per day. So, for example, a club could use its allocation to enter 6 pairs, each playing in both events. Or 12 pairs (24 players), with half playing GC and half playing 6W. Or something in between, e.g. 4 pairs playing both events, plus 2 pairs playing GC only and another 2 pairs playing 6W only. If a club exceeds this allocation, extra entries will be placed on a waiting list. If, as of June 28th (the “allocation date”), there is space remaining, remaining entries will be allocated among all clubs with entries on either waiting list. If, after this second allocation, there is still space remaining in the tournament, entry will be first-come, first-served, up to the final entry deadline of July 12. Flight assignments will be based on the average handicap of the two players. (Exception: an entry with a large handicap difference will play in the flight appropriate for the lower handicap player, as determined by the Tournament Director.) GC players without USCA handicaps will be assigned flights by the Tournament Director. Each entry will represent their NC croquet club in the Penwell Trophy competition. Points are awarded to each entry that finishes 4th place or higher within a flight. The club with the most points is the winner and will have their name inscribed on the trophy. The winning club will also receive a plaque (no other trophies will be awarded). The tournament fees include morning coffee and lunch each day, including the finals brunch. The Avery County website lists a broad range of lodging and dining venues. There are also rental properties available at Grandfather Golf & Country Club and at Linville Ridge Country Club. Farther afield, there is plenty of lodging in Boone. This is a popular resort area. Book your lodging early. Linville is in Avery County, at the junction of highways 105, 181 and 221 (about 18 miles SW of Boone). The Eseeola Croquet Club is directly across from the Eseeola Lodge, just south of the traffic light. The other tournament sites, Grandfather and Linville Ridge country clubs, are about two miles north on Hwy 105.